Edit: Permission to edit information within the Staff module (i.e. staff profile data). Delete and merge: Permission to delete and merge staff profile pages. Staff charges read: Permission to read the "Charges" on the Staff profile page. Admin: Permission to create + manage notes categories in the Staff module, and designate which users have access to view and create notes in those categories. To allow an admin user to view notes on your staff profiles, go to Admin > Staff tab > Notes > edit the appropriate Notes category > Select this admin user > Edit category > Save changes. Read: Permission to read the "Salary" information on the Staff profile page. Read: Permission to read the "Application" and "Interview" information on the Staff profile page. View + manage Advanced reports: Permission to access the Staff advanced reports page (i.e. create and save reports; manage advanced report categories). Send e-mail from Advanced reports: Permission to send a mass e-mail to everyone generated in a Staff advanced report. Export spreadsheets from Advanced reports: Permission to download data from a Staff advanced report as a spreadsheet. 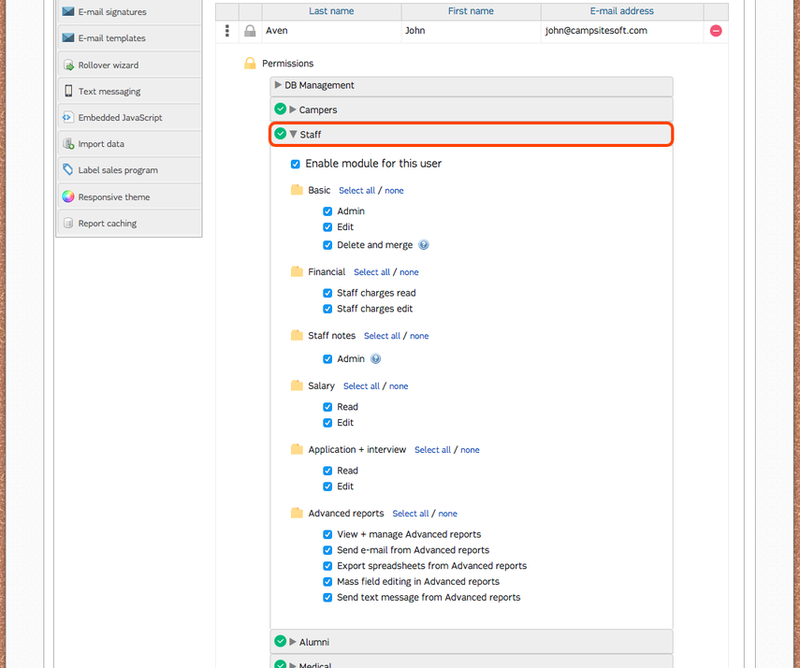 Mass field editing in Advanced reports: Permission to use the "Edit" button in the Staff advanced report toolbar to mass edit staff profile data. Send text message from Advanced reports: Permission to send a mass text message to every staff person generated in a Staff advanced report.